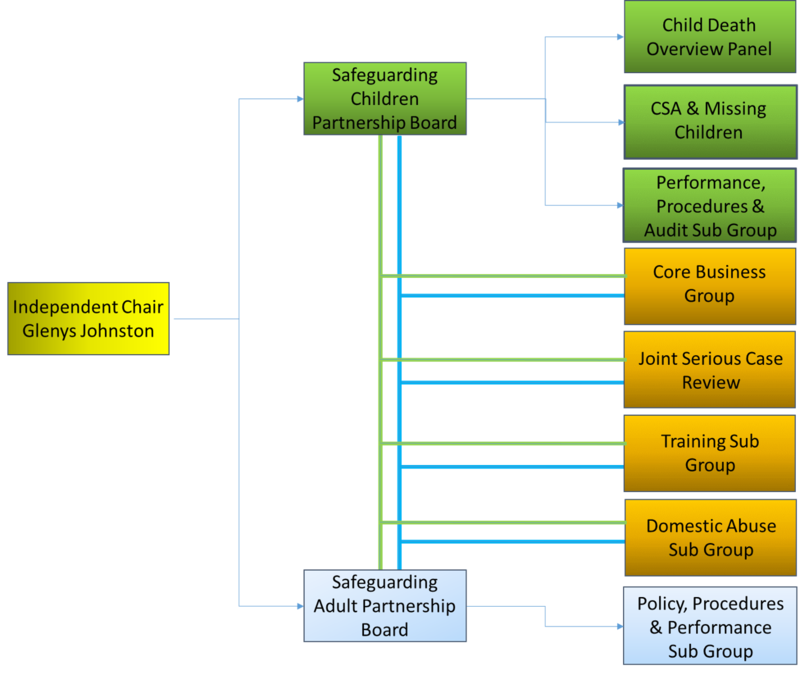 There are a range of sub-groups which perform the work of the Board. The Serious Case Review Sub-Group, Core Business Group, Domestic Abuse Sub Group and the Training Sub- Group are joint groups for Adult and Children’s issues. Other sub-groups focus specifically on Adults’ or Children’s issues respectively. Sub-groups meet once within each Board cycle. New ‘working’, or ‘task and finish’ groups may be periodically established to take forward particular areas of work for a time limited period. For further information on the work of each sub group, please see the relevant section below. Producing and circulating adult safeguarding policy and procedures. Promoting policies and procedures across organisations and departments. Establishing a performance framework, gathering and analysing performance data, identifying and evidencing outcomes to assess the effectiveness of safeguarding work with adults. Supporting agencies and organisations to achieve agreed safeguarding standards as outlined in the Memorandum of Understanding. establishing a performance framework, gathering and analysing performance data and identifying and evidencing outcomes to assess the effectiveness of safeguarding work with children. The Core Business Group is the sub-group of the Safeguarding Partnership Board (SPB) with the responsibility for coordinating and supporting the implementation of the Board’s business plan, monitoring the business agenda for the Board and ensuring the effective communication of safeguarding messages to all audiences. N.B. the SPB remains the decision-making body. The TSG has the responsibility for monitoring of the effectiveness of multi-agency safeguarding training throughout Jersey. Providing a forum to focus upon abuse and violence in the domestic relationship. Monitoring the actions of agencies\services to reduce the incidence and impact of Domestic Abuse. Working to help all those affected by Domestic Abuse. Ensuring that we draw upon the experience of those who have been subject to Domestic Abuse. Increasing public awareness of Domestic Abuse related issues and broadening the reach of the Group. Monitoring the effectiveness of the strategy and services provided and learning from experience. The Serious Case Review (SCR) sub-group has the responsibility for undertaking SCRs in respect of children and adults and for advising individuals and organisations on lessons to be learned; the SCR SG also has the responsibility of monitoring the implementation of SCR recommendations. Consider cases referred for review on the basis of concerns as to the way Board partners or others have worked together to safeguard an individual, adult or child.